Organiser: The contest is hosted by ACM Student Chapter NIT Warangal. 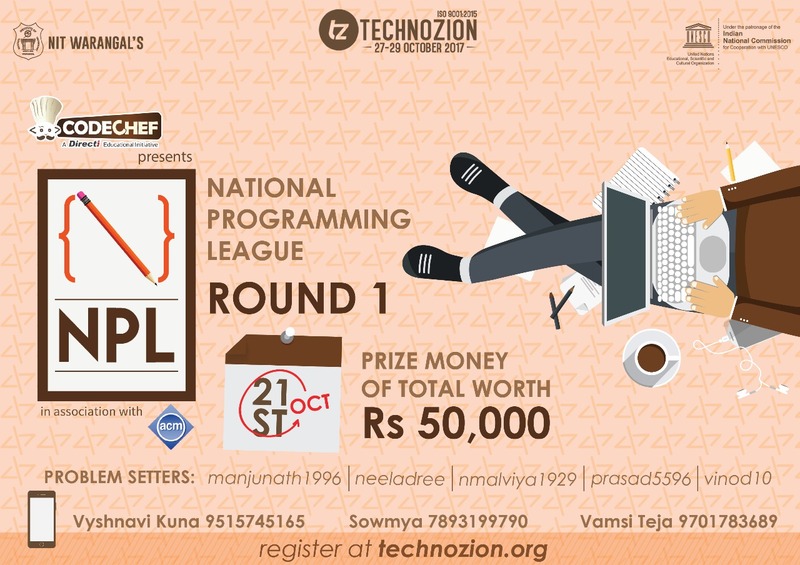 This is the qualifying round for South India's second largest technical fest Technozion's National Programming League. Next round will be held onsite at NIT Warangal. This contest will be open for all. Prizes: Prizes worth 50K for onsite round. Please fill this form if you are willing to come for onsite round of NPL. Registrations for prizes: If you are willing to join us for the on-site round please register here. Please contact vinod10choudhary@gmail.com for any queries during the contest. Those who are willing to participate in onsite round of NPL should fill the google form, whose link is given in Prize section.